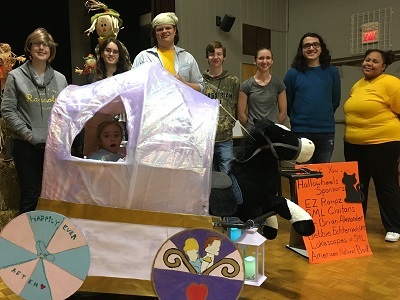 Congratulations to Randolph College Society of Physics students who won the Hallowheels competition for most popular costume design, with their rendition of Cinderella’s carriage for sweet 6 year old Maddie. Hence, she was Maddierella! Here she is on Halloween night, trick or treating! The Randolph College students raised almost $1000 for CATS. CATS will use this money to fund replacement parts for second hand pediatric adaptive devices and mobility equipment which they refurbish and give away to children who need it, at no cost to their families. To view all the results, click here! Roanoke Valley Gives Day a Success!